Proven Ways to Reduce your Office Phone Bills for Multi-Site Business: Cebod telecom "
If you are a business owner, you very well know just how important it is to offer your employees and customers an easy and efficient way to communicate. Email is a popular option but there are just some things that need to be handled with a person-to-person conversation. While some businesses will just call an in-house staff meeting, this isn’t really practical for everyone. This is because there are many businesses today which operate multiple sites. Whether your multi-site business is small or medium sized, there’s no doubt that you, your employees and your customers or clients can benefit from the implementation of a cloud based phone system. Do you want to know how your multi-site business can reap the benefits of a cloud based phone system? Here are a few of the many ways the internet phone system can help out your multi-site business. Saves Money – Of course the goal of every business owner is to increase their profit margin and you do so by offering the best possible services or products without spending too much money. Well, believe it or not, a cloud based phone system is a whole lot less expensive than traditional land lines. Not to mention, there are no expensive hardware costs associated with the use of a cloud based phone system because all of the calls can be managed on a computer or a smartphone. Saves Time – Traditional land line phone systems can experience technical problems every once in awhile and they often require maintenance. If you have a multi-site business, you’ll need to have a team of maintenance professionals at each location or pay for each location to be serviced by a contractor. Needless to say, these expenses can quickly add up. Not only will a cloud based phone system save you money, it can also help save you and your employees lots of valuable time as you won’t have to deal with such frequent disruptions of service. Easy to Set Up – One thing that many business owners appreciate about cloud based phone system is that they are really easy to set up. This especially rings true for owners of multi-site businesses. Since these internet based phone systems don’t requite any kind of special equipment or rerouting, they can be set up in no time. Increases Efficiency – There are a number of useful features and capabilities that come along with a cloud based phone system which can help increase the efficiency of your multi-site business. Direct extension dialing and the ability to forward calls to mobile smartphones are just a few of the many features that make a cloud based phone system a more viable option than traditional land lines. 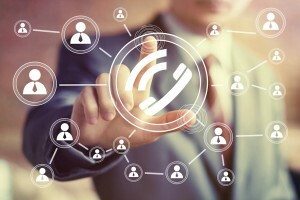 Traditional land line phone systems are now becoming a thing of the past and cloud based phone systems will soon be the norm thanks to their convenience and affordability. For these reasons alone, the choice really shouldn’t be difficult at all. It is clear to see that there is no better option for multi-site businesses than a quality cloud based phone system. Read more about multi-site company communication solutions.